The Writing Life: Who Are Your Mentors? Who are you listening to and then applying that information into your life? Whether you call them mentors or not, whatever feeds into your life are voices where you are listening to information. It can affect the results of your life and work. As I think about my own writing life, it is built on a foundation of great lessons and teaching from other writers. In the early days of my freelance writing, I wrote many personality profiles of bestselling authors. I wrote these articles for different magazines but it gave me the opportunity to spend time with each of these authors on the phone or in person. I would quiz these authors about the details of how they practiced their craft and connected to their audience. My hour-long conversation contained a lot of information which never made it into my 1,000 word magazine article—yet built experience and lessons into my personal life. In this article, I want to provide several resources which I use daily for inspiration, learning and mentoring in my life. The first one is from Darren Hardy, the former publisher of Success magazine. Some time ago, Hardy began the Darren Daily which is a short five day inspirational thought which comes via email. It's free and I listen to it early in the day when it arrives. Follow this link to see his recent one about mentors and scroll down to the sign up form and you can begin getting it in your mailbox and listening to it. The various books that I read is another way that I discover mentors. Recently I completed 2 Chairs (Worthy Publishing) by Bob Beaudine that releases on August 23rd. The overall message of 2 Chairs is to make time every day to meet with God and listen to the Holy Spirit. For many years, I've been having a daily quiet time in the Scriptures. Each year I select a differnt version of the Bible and read it cover to cover in this time. 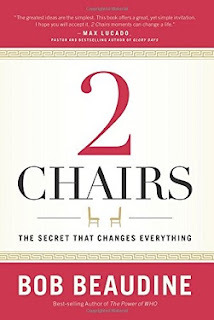 While I thought 2 Chairs had a “different” title, I love the insight and wisdom contained in this book and recommend it. If you don't have this daily pattern of reading in your own life, I recommend it. My third method of teaching and insight is to read my twitter feed. Maybe you go by once a day or several times a week and check the various articles. I read the various articles and information that I post—and I apply it to my writing and marketing efforts. You will gain from it as well if you feed this information into your routine. One of the keys to continued growth and learning is a personal commitment, then an attempt to find balance in your life. There are days when I'm not learning and out of balance but it's something that I have as a continue force in my life. I hope these three ideas will help you find the mentors for your writing life. 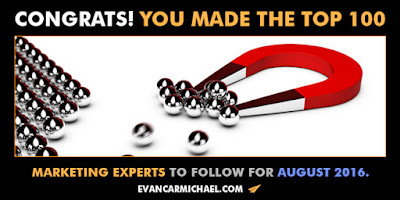 Once again I made this list of top 100 Marketing Experts on Twitter (#56). I hope you will check it out and hopefully will give you more ideas as a writer. We have an advantage over years past. Now, online connections help battle the isolation of a writer's life. Thanks for the tips! You are exactly right. The internet has leveled the playing field and helped writers not be so isolated. It's easier to reach people than ever-but we also need to make sure that our craft and writing and pitches are excellent in that process. As we discover different mentors, we need to use wisdom and select them with care--then take action on their teaching. Thank you for this comment.